Francisco Kjolseth | The Salt Lake Tribune Starting at Zion Canyon Village in Springdale, cyclists compete in the scenic first stage of the 2016 Tour Of Utah on Monday, Aug. 1, 2016. Covering 84 miles with 6,679 feet of vertical climbing, the seven-day, world-class professional cycling race passes lava fields, high alpine forests, Cedar Breaks National Monument and more. The Tour of Utah unveiled its six race stages and distances on Wednesday, with a premium once again put on scenic locales and grueling climbs. This year’s Tour will comprise a total of 536 miles with 43,780 feet of elevation gain when it runs Aug. 6-12. It marks the fifth time in 14 years that the race will include more than 43,000 feet of climbing. 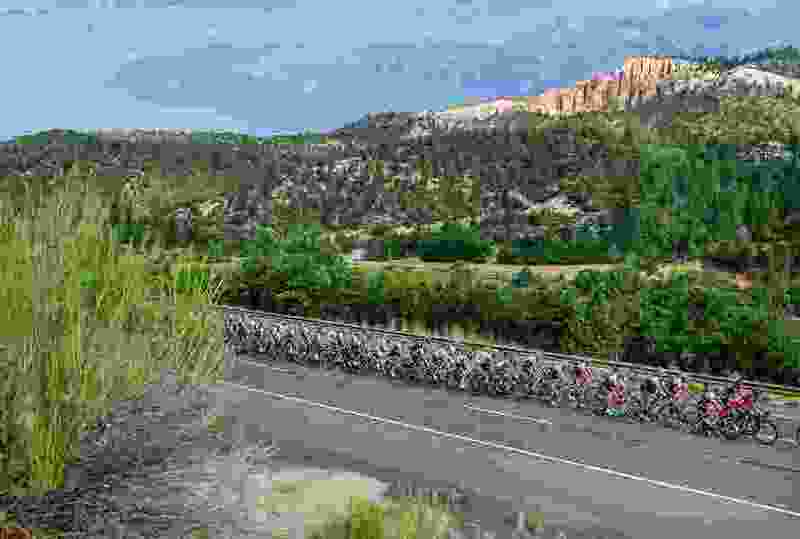 Included in those climbs is a Tour-opening ascent from Cedar City to Brian Head Resort, which sits at over 10,000 feet elevation. Other notable Tour climbs include the Mount Nebo loop, Little Cottonwood Canyon and Empire Pass, with that stage ending, as usual, at Snowbird Resort. The final stage, to be run around Park City, will also feature several hefty ascents. The Tour of Utah prologue, the race’s ceremonial start, will be held in St. George on Aug. 6. 1. Aug. 7 • Cedar City, 101 miles, 8,950 feet elevation gain. 2. Aug. 8 • Payson City, 88.6 miles, 6,750 feet. 3. Aug. 9 • Antelope Island to Layton, 104 miles, 4,350 feet. 4. Aug. 10 • Salt Lake City, 68 miles, 5,500 feet. 5. Aug. 11 • Canyons Village to Snowbird, 95 miles, 9,975 feet. Aug. 12 • Park City, 76.7 miles, 7,950 feet.